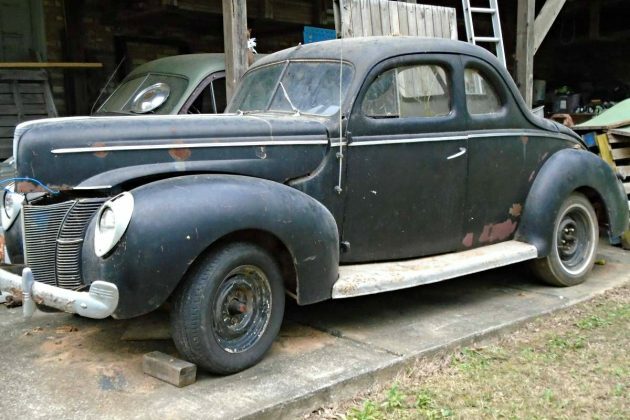 After 62 years of ownership, and several decades spent in a barn, this ’40 Ford Coupe is up for sale. Very solid, and even in running and “driving” condition, this Ford is a sweet project with great styling. This appealing find is offered for $14,500. Check it out here on craigslist out of Gardendale, Alabama. Thanks to Michael for this remarkably solid and stylish find! Taking a peek at the interior reveals a rather nice appearance with a fair amount of dust and dirt from the nearly 50 years spent in a barn. The carpet has been removed from the front floor boards, and there is some evidence of surface rust on the floors, and maybe even a small amount of rot. 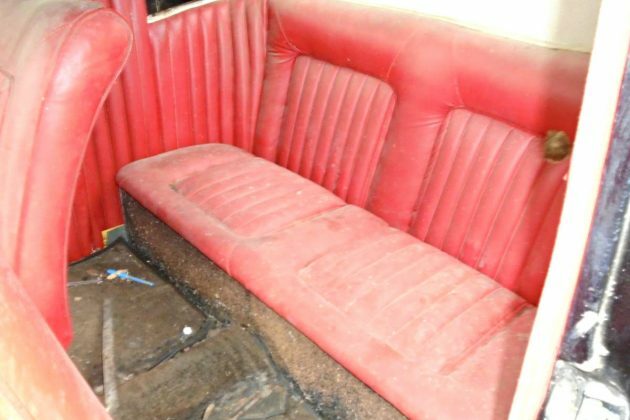 I dare say that the upholstery could be cleaned up nicely, and that this Ford could possibly be enjoyed in its current state of patina. The rear seating area is equally as nice as the front, but again would benefit greatly from a good cleaning. I will say I am rather pleased with the interior as it avoided becoming a mouse motel over the long period of storage. 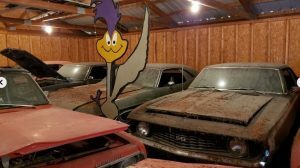 There are no pictures of the engine, but I am assuming it to be a 49-50 Mercury Flat head V8, and it is apparently in running condition. The car is listed as running and driving, but with no brakes. Perhaps they throw a ships anchor out the window to stop this old Ford? Weathered but solid, the exterior of this Ford is quite promising, and looks as if it could be enjoyed as is depending on your flavor. There are some trim pieces and lights missing, but as a whole this seems like a great project. 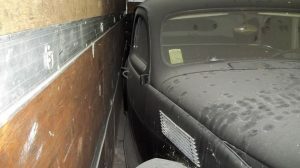 The seller has mentioned “one dent” but I am unsure of where it is. It may be my imagination, but the rear roll pan area below the trunk looks to have a dent, and I am curious if the car has been bumped before due to all of the visible primer in that area. I see no extensive damage, but a lot can happen in 78 years. The rear bumper is missing, and the front bumper is in place but its chrome is peeling. The hood has some surface rust, but seems solid. Considering the fact that this project runs is a great start to having a possible driving project to work on and enjoy at the same time. The styling is nice, and it seems there are so many directions that this project could go in. What would you do with this ’40 Ford Coupe? Great looking car and a hot rod icon. Interior has a nice ’50s or ’60s custom look, probably genuine! Clean it up, make it work, and drive the snot out of it – guaranteed to be a smash hit at any car show. bringing my girlfriend home I went to apply the brake and my foot went right through the floor. Boy, I could’ve used an anchor that night. And a new pair of underoos, no doubt. One of my favorite Fords. Been in love since the first one I saw as a kid in “The Blob”. Just fix the brakes, clean it, and if there are no vintage speed goodies on the Merc flathead the ad says it has, add some. Then enjoy! A ’34 and ’40 on the same page. The advertisement says they’re only asking $11500. Maybe they’ve dropped the price already. It would be a lot of work to still but, these are a top hot rod right behind the ’32 and ’34s. 40 Ford coupe was the epitome of cool when I was a high school student back in the early 60’s. Now I look at this one and I think it still is. Back then to drop an Olds v8 with 4 speed then send it to Tiajuana for paint and tuck n roll and you became the coolest kid in school. For me it was only a dream that never happened, but there were a few around Shasta County California that were drool makers for the rest of us less fortunate ones. Oh I almost forgot you had to have spinner hubcaps. Or Flipper wheel covers ! The ’40 (either Standard or Deluxe) is definitely an icon. This is a candidate worthy of a decent cleanup and maybe some mild restoration. 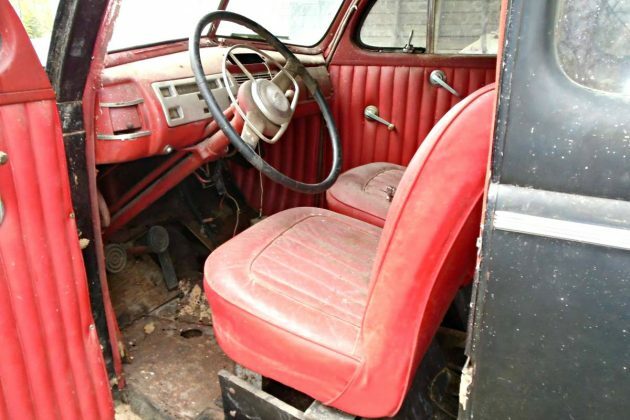 I’m not wild about the naugahyde upholstery and would eventually put the original style cloth back in. The engine, while I’d search out a correct engine, or at least a 59AB, would be one of the last things to change. An 8CM engine (if that’s what’s powering it) would carry the car anywhere you wanted to go, and fast too. But I still prefer stock. Anyone with aspirations of hot-rodding this should head right over to Bob Drake and get a reproduction…. Naugahyde upholstery is well worth saving! It’s been years since I’ve seen true naugahyde, everything else is a cheap knock-off. Since the U.N. put a freeze on the hunting of Naugie and pledged the resources nessessary to restore their former habitat, the population is finally starting to rebound. There may come a day when naugahyde will again become available to the general public, until then it’s incumbant upon those of us in the hobby to preserve what is still serviceable. There are those that will say that Naugie should NEVER be used again in such a manner but as we all know, once we see it used again in high dollar cars it’ll only be a matter of time before everyone else wants it too. Status symbols are weird that way. I love the interior just as it is. Looks like it will clean up well, although I think there is a hole chewed in the rear seat back? This is a great car. 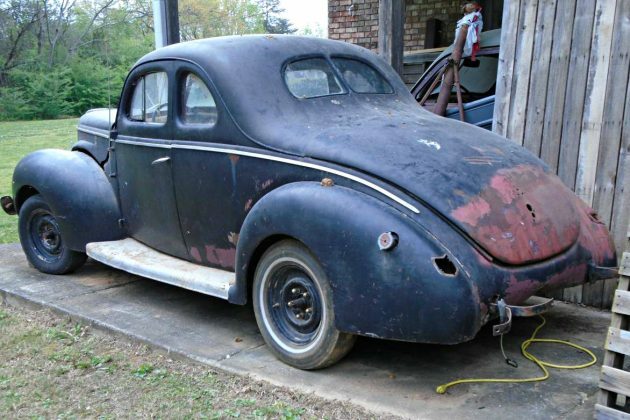 The price seems fair for a ’40 coupe that looks to have very little body rot. These have a strong following so this one should sell quickly. Good thing I live far away from Alabama or I might have a problem keeping my “no more projects until my others are done” promise. I once had a Chrysler Cordoba from the 1970s with “Genuine Corinthian Leather interior” Pretty sure this along the same lines as uber rare Naugahyde. I also had some BATES MC accy “Pleather” jackets and pants from an old MC shop inventory and cut them up for seat upholstery but someone else had the last laugh as while I thought it was useless and just a sweat box to wear,, Genuine Bates Pleather now commands over $400 for one of these jackets. 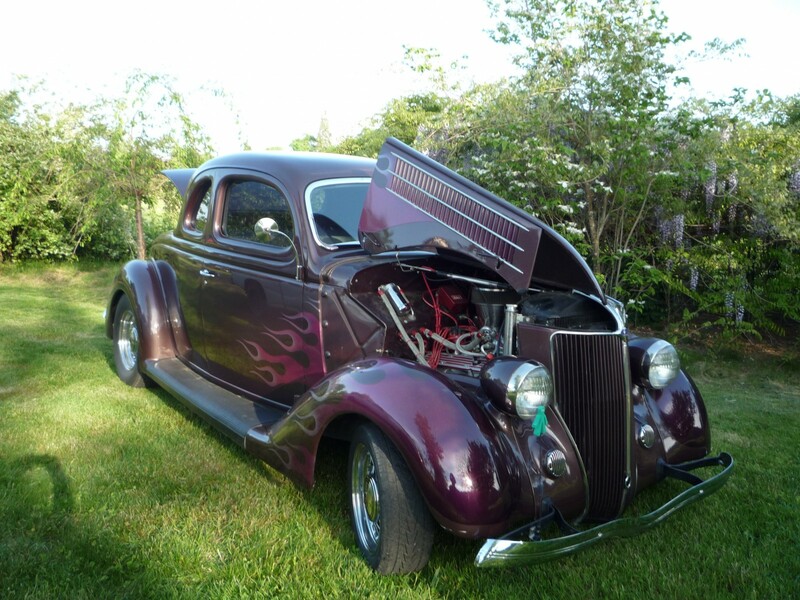 Actually it is more fun to hotrod an original, after all, that’s what this one is all about……..
A buyer would be better served buying my ’36 Coupe fully restored street rod for 35K. The ’36 is also one of the most favored designs of the ’30’s and 40’s. ctmphrs. Of course there is. My 36 is a frame off rust free restoration done in the style of a street rod. (e.g. Modern running gear, air etc. I can drive it all day at freeway speeds. 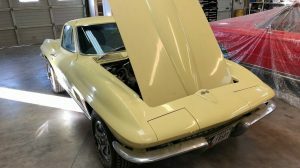 — As opposed to a frame off restoration to stock. I had a nice frame off 1951 Ford Convertible restored to stock. It was a flat head V-8 with stick shift and overdrive which would allow it to cruise at 65, but it did not like it, feeling more comfortable @ 58 which is about 20 mph slower than the traffic moves here. That is too slow as I always worried about some person crashing into my trunk. It was a lovely little car and had I kept it–and I wish I had– I would have dropped a 289 or 4.6/5.0. Sorry folks I’m a purist don’t even believe in old new stock. I have a ’39 standard coupe that I’ve had since my oldest son was conceived and he will be drawling social security in a few years. ’39 Standard ! Very cool ! My favorite is the ’39 Standard Tudor. Craigslist says $11,500, that would be pretty fair, for a running driving, no stopping 40 coupe. Everything it deeds is available after market – repo and most of it is decent. Nice coupes start about 30K , so very possible to not get buried in the car. If I was dumb enough to want another project, I would consider it. While these are indeed iconic, either restored or more typically hot rodded, its remarkable to me that the Fords seem to command the top dollar but there are other similar body shapes/styles nearly identical that dont go for nearly as much money. I have had a number of prewar coupes, Pontiac, Chevy, Plymouth and Dodge and only a certain segment of experts can tell the difference between them. I just sold my 37 Pontiac coupe project to a young man in his 20s who was very excited to get it. I still hold out hope for future generations. “White Lightning.” Ray Evernham did a segment of his ” AmeriCarna show about the shine runners, revealing the trick “overload” spring setup they would use to fool the revenooers. 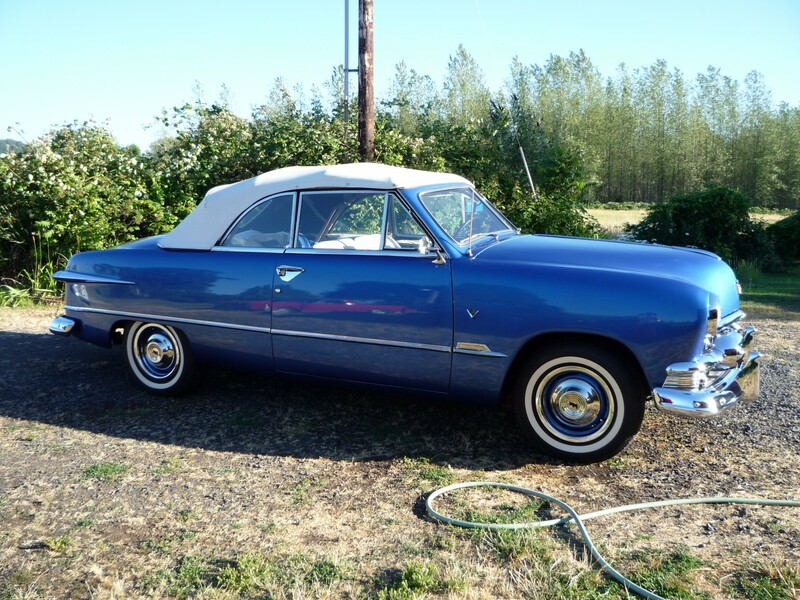 Alcohol is not as heavy as water, but at about 6 lbs / gallon, to haul enough to make it worthwhile would make the car a taildragger, and if you beefed up the rear spring, the raised rear end would alert the cops to the fact this car was used to haul shine. What Junior and others did was to put a coil spring between the leaf spring ends with just enough slack that it only came into play when the rear of the car was weighted down. ( Remember, these cars still had the single rear leaf spring that ran from side to side like the Model T and Model A. ) When weight was added to the car, it would stretch the coil spring, keeping the ride height the same as when empty. Another trick was to make a box to replace the seat spring assembly, and push some of the load forward from the trunk into the area below the seat. Wonder whatever became of Lumpy’s convertible like this that was on Leave it to Beaver? How this car escaped being a Gasser or a Rum Runner, like Doug says, is beyond me. The car of choice for both. 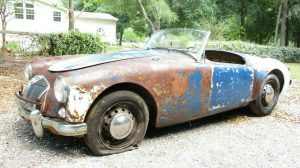 While I feel it should be restored to either, we all know, interest is fading with those types, and it will surely be resto-modded, and I suppose that’s ok. I live near Naugatuck…there are still a few naugies around in the forests….yes..a ’40 and a ’34 on the same day…..love em. My first car I bought myself with no adult supervision! Grit newspaper and car wash money, which I also earned myself! It was a ’40 Deluxe coupe and I was thirteen! A young local guy who reportedly ran shine got caught and needed money to get out of jail and get a lawyer. His dad put it out in front of the service station where I worked after school and on saturdays! I asked his dad if he wanted it washed and waxed and he told me no, it needed to be sold asap! After his dad left, I ask my boss how much it would cost to buy it and he told me two hundred dollars cash! I told him to call the guy’s dad and tell him I wanted to buy it! He told me I’d better ask my dad about that and I was very disappointed! Later, while my boss had gone home for supper the dad came by to see if anybody had ask about buying it! I told him yes and when he ask who, I told him I did! He repeated what my boss had said about asking dad about buying it! He also ask me if I had that kind of money? I quickly told him I did and that I could pay cash! His eyes lit up and he said, “I want my boy out of jail before tonight!” and the first person who comes by here with the cash is going to get it. I knew my dad wouldn’t be home before somebody else bought it. My boss came in and I went across two streets and the rail road tracks to my grannie’s for dinner! I tried to call my dad at work but could’nt get him. He was driving home to dinner and in those days, no cell phones! I wolfed my dinner down and ask my grannie if she had two hundred dollars I could borrow and she wanted to know what I needed it for and I told her I had bought a car and the man I bought it from was over at the service station and wanted his money! I told her I had tried to call my dad but couldn’t get him. I also told her I would pay her back as soon as my dad could take me to the bank and get my money out of my savings account! She never ask if my dad knew about me buying a car so I never said anything about that! I went back to work and payed the guys dad and he gave me the keys! I had to leave it at the service station because I had no license and my mother came to pick me up at night. I put the car in the wash rack and helped my boss close up the station. My mom pulled in and I loaded my bike, bycicle!, in the back of her station wagon. No mention of buying the car so we rode home silently. The next morning my dad filled up his truck at the service station and my boss showed him my car, thinking I had already told him about buying it! Sparks flew and my dad went looking for the dad who sold it to me. He told my dad the money was gone and he couldn’t give it back so we would have to keep the car. He felt sure his son would want to buy it back. However, his son had had it’s engine changed out to a hopped up flat head Cadillac engine! My dad was very mad at me until he found out I only paid two hundred dollars for a screamer of a forty Ford coupe with a very fast caddy engine propelling it like a slingshot! When the guy who owned it got out of jail he wanted his car back but my dad said no deal. A big ruckus ensued but we kept the car and that started my dad and his buiness partner’s dragracing! And the rest is history! Eventually my dad and his partner bought a ’39 Ford four door and sold the kid the ragged out coupe. We had blown up the caddy engine and the thirty nine had a strong dragging full race Oldsmobile in it when we got it. By then I had gotten my drivers license and we raced the ’39 on the country roads all over the North Carolina hillbilly county we called home!!!!! Nope, we never hauled shine, but always wanted to!!!!! Great story Howard, When I was 14 I bought a 69 or 70 Chevy sedan from a neighbor kid for $75 of berry picking money. Drove it all over our rural area in Corbett Oregon. Cost me a fortune in gas too because it seemed to get about 5 miles to the gallon and it was in need of a tune up and lord only knows what else.